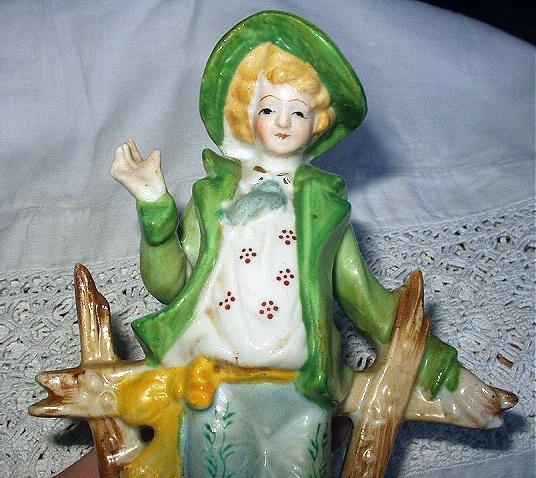 Nice porcelain figurine of an Colonial man dressed in a green jacket and matching wide brimmed hat. Has a puffy white shirt with red dot design, low yellow waisted cloth belt and knee length pants. Is standing in front of a wooden fence. Gold accents on his shoes and at the front of the base. 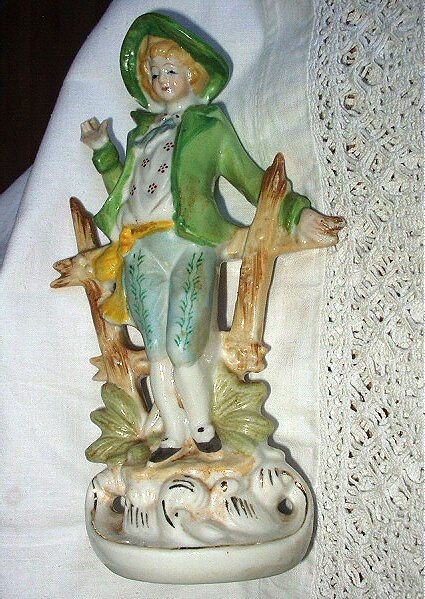 This is a RARER porcelain piece created around WWII. 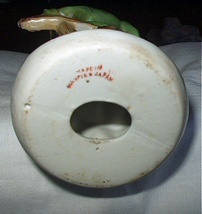 Is marked on the bottom of the piece: MADE IN OCCUPIED JAPAN, in red mark. EXCELLENT CONDITION, no chips, breaks, hairlines. 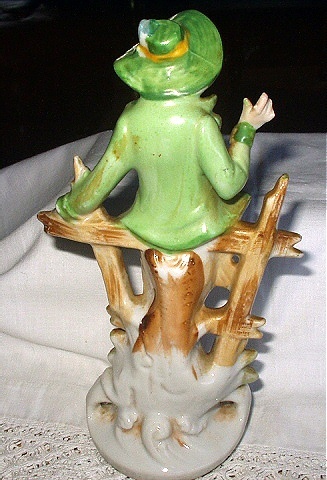 Measures 7-1/2 inches high, 4-1/2 inches wide. Please make sure to view our other many listings we have offered. Always glad to combine orders for added shipping savings! Lay-a-way option available upon request. Shipping/Handling in the U.S.A. will be 12.50. THANKS FOR VISITING ANTIQUE FINDS. ***WE GLADLY SELL WORLDWIDE JUST ASK FOR SHIPPING QUOTE. *** REASONABLE OFFERS ENTERTAINED.